Written in 1962, Barbara Tuchman’s The Guns of August is a Pulitzer Prize winner. Though not for everyone, in my opinion this book deserves the accolades that it has received. The work covers both the events leading up to the outbreak of the First World War, as well as the early months of the conflict. The early chapters in the book cover the diplomatic and political situation prior to the war’s outbreak. In some ways, this book is a character-based history, as it focuses on various members of the European Royalty, politicians and generals. A clear but selective picture of the diplomatic and political maneuverings prior to the war is presented. The later chapters are an account of the military and political developments that occurred during the first months of the conflict. Though the book covers action in both the Mediterranean and along the eastern front, the majority of its words are dedicated to events that occurred on the western front. This book is full of information and is extremely interesting to read. Yet, there seems to be gaps in the picture that Tuchman presents. I would not classify this as a comprehensive history of the outbreak of the First World War. Tuchman tends to focus on certain aspects of important events and omit others. This seems to be the result of her trying to illustrate particular themes that she deems important. Thus, this book is best viewed as the examination of particular events and themes. For instance, regarding the causes and events leading up to the Ottoman Empire’s entry into the war, Tuchman devotes many pages to the German Warships’ Goeben and Breslau’s voyage and diplomatic/military mission to the Ottoman Empire in 1914. This event is extremely interesting, and it is of great historical importance. It played a key role relating to the Ottoman’s entry into the war. Yet, the author provides scant information on the political events within the Ottoman government beyond that relating to the German ships and their mission. An understanding of these political maneuverings seems instrumental in understanding how and why the Ottomans entered the conflict. Such omissions exist elsewhere in this history. It is clear that instead of a comprehensive history, Tuchman is attempting to highlight particular points that are both interesting and important. With all of that, she accomplished her goal brilliantly. A good example of the many exceptional points in the narrative is highlighted in the account of one small incident that occurred at the war’s onset. When the German ambassador delivered his country’s declaration of war to the Russian minister, both men initially traded angry words. However, they both quickly came to the realization that monumental and terrible events were beginning and attempted to comfort one another. Another significant point about this book is that it is approximately half military history. I read a lot of this sort of history book when I was younger. Though I generally stay away from such works these days, I found these parts to be interesting and, at times, riveting. The fact that they were well written and understandable helped a lot. With that, if the movements of armies and ships are the kind of history that one would rather stay away from, this book may not be the best choice. The writing is often suburb. This high quality prose melds very well with the themes that Tuchman chooses to highlight. In the book’s opening lines, she describes the last gathering of European Royalty before the war at the funeral of Edward VII. This assembly was symbolic of the end of the era that the war brought. This is a great history book. It is reflective of the author’s view of events. Her view is illustrated with insight, intelligence and in a convincing way. 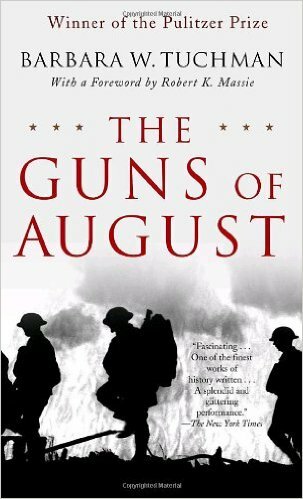 It paints a strong and coherent picture of many events that set the stage for this terrible conflict. If one does not mind a good chunk of military history mixed with a general history, this will be an informative and enjoyable read for anyone interested in this subject. I also read Tuchman’s A Distant Mirror: The Calamitous 14th Century which I found to be excellent. My commentary on that book is here. 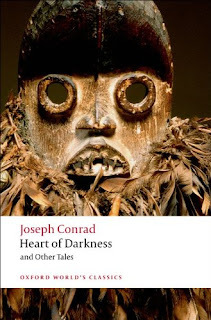 Heart of Darkness by Joseph Conrad is a famous novel about the darkness that pervades both the outer world as well as the inner mind of humans. This is a short, dense novella that is full of ideas. Though the narrative is relatively straightforward, it is a story that is full of symbolism as well as philosophical and psychological musings. Charles Marlow tells the story in first-person narration. The protagonist is a steamboat captain hired by a company that is involved in the ivory trade in the Congo during the late nineteenth century. Marlow is taking a steamboat up river. His ultimate destination is a remote trading station headed by Station Manager, Mr. Kurtz. The mysterious Kurtz is admired by the various people that Marlow encounters in both England and in the Congo. Both early and late in the story, Kurtz is portrayed as man of enormous talents and charisma who elicits near worship in people. As he proceeds with his journey, Marlowe is exposed to the horrors of Colonialism that include slave labor as well as indigenous people starved, beaten and worked to death. All in one passage, the European passengers of Marlowe’s steamboat unleash murderous gunfire upon a mass of helpless Congolese who have conglomerated on shore. When Marlow reaches Kurtz’s station, he discovers that the Station Manager has developed a messianic following among the locals. There are indications that Kurtz has led his followers to commit atrocities in their quest for ivory. Both the Europeans and the Congolese present at the station seem to worship Kurtz as a kind of god. The writing conveys a sense of ominousness. The story and themes of this work are fairly well known and have been written about extensively. It is an examination of the darkness within humankind. As is often the case with literary journeys, Marlowe’s trek up the river is symbolic of a journey into the worst aspects of the human soul. The themes of cultish personality, death and Colonialism are also explored within this work. So much has already been said about this book. I want to write a few words on a specific and particular aspect of it. Throughout the novella, images of jungle and natural world are common and play an important part that relates to the story’s themes. Within this tale, the natural world plays a constant and ominous presence. It clearly reflects the darkness and near impenetrability of the dark angle of human nature. At times, it almost seems like a character in and of itself. Coasts, as they are observed from ships, are given human characteristics here. They sometimes are smiling, frowning, mean, savage, and they even whisper. The particular coast that Marlow is observing exudes “monotonous grimness.” What I think is most important here is how human settlements are described as ”specks” and “pin – heads.” The symbolism seems to play a key part here. If the landscape represents the darkness and grimness in human existence, our efforts at building the pieces of civilization within it seem like insignificant specks. The great wall of vegetation, an exuberant and entangled mass of trunks, branches, leaves, boughs, festoons, motionless in the moonlight, was like a rioting invasion of soundless life, a rolling wave of plants, piled up, crested, ready to topple over the creek, to sweep every little man of us out of his little existence. And it moved not. Here we have the contrasting image of nature that is unmoving, but at the same time, a “riotous invasion.” Perhaps this is how Conrad sees the evil in the souls of people. That evil is quiet and unchanging, but it affects the world like a “rioting invasion.” “Little men” are swept out of existence before it. The above quotations are just two examples, among many, of a threatening landscape that is capable of crushing humanity. Such a landscape seems to be a mirror upon the worst aspects of the human psyche. There is so much more to this short tale than I have touched on above. The images and symbolism relating to the jungle are only a small part of a very rich piece of literature. This book was surprisingly dark for its time. Within its pages, it still has a lot to tell us about the darker nature of human beings. Can You Forgive Her? 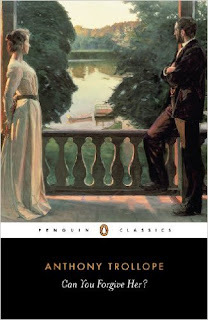 by Anthony Trollope is the first of The Palliser Novels series. This is another book that I loved by Trollope. Like several of the author’s books, the narrative covers parallel, but interrelated, stories. The book’s main protagonist, Alice Vavasor, is flawed but fascinating. Alice’s marital engagements and subsequent breaking of them comprises the novel’s main thread. The book opens several years after she has ended an engagement with her cousin, George Vavasor. George is a volatile young man. Though he eventfully descends into complete perniciousness, upon the book’s opening, he is not without some positive character traits. George’s sister, Kate, plays an important role as Alice’s confidante and an early advocate for Alice’s and her brother’s engagement. At the story’s beginning, Alice is now engaged to John Grey, a man of high status and decency. However, he finds it difficult to express his genuine emotions. Over the course of the tale, Alice is persuaded to break her engagement with Grey and once again becomes betrothed to George Vavasor. George slowly descends into the dark depths of spite, greed, rage and violence. At one point, he physically assaults his sister Kate. As his personality spirals out of control, so does his relationship with Alice. Another subplot involves Lady Glencora. Before the events of the novel, Glencora fell in love with Burgo Fitzgerald. Burgo lacks the social status and wealth of Glencora. He is also irresponsible and immature. Their subsequent engagement is broken up by wealthy and powerful family remembers. Glencora goes on to marry the stiff, but socially acceptable, Plantagenet Palliser. Trapped in a loveless marriage, Glencora stills pines for Burgo and eventually toys with plans to run away with him. However, as the plot develops, in typical Trollope style, we find that Plantagenet is not without his virtues. A third subplot involves the clownish Mr. Cheesacre and Captain Bellfield in competition for the affections of Alice’s aunt, Mrs. Greenow. This thread is mostly humorous, but Trollope’s characters always manage to show complexity and exhibit real emotion, and this segment of the story is no exception. I have previously read Trollope’s Chronicles of Barsetshire series. This book was darker. It included themes of violence, suicide, tragically failed love affairs and characters’ descent into moral degeneracy. Along with these darker notes comes additional complexity. Even sympathetic characters commonly engage in questionable acts, with Alice’s tendency to enter in and out of engagements being a prime example. There are so many fascinating charters and themes within this novel. I am tempted to write in detail about several. I find that the characters are even more multifaceted then they were in The Chronicles of Barsetshire. This is saying a lot. The interaction of these characters adds to the plot’s sophistication, and it is a joy to read. Though there are multiple directions that one can go when pondering this work, I want to devote a few words to Trollope’s examination of the men of this era. This novel delves into the subjects of repressed emotions and actions as well as their wilder and darker personality traits in all sorts of interesting ways. In its depiction of men, it is in some ways contrarian to many other works of this era. Early in the narrative, Trollope seems to mislead the reader bit. Based entirely upon Alice’s temporarily negative thoughts, as well as Kate’s negative statements about him, one suspects that Grey is cold and emotionless. He is indeed, like several other male characters, very reserved and not expressive of his feelings. However, as the story proceeds, we begin to discover that deep inside he experiences real emotions, including great pain when Alice breaks off the engagement. We see something similar, though not as strong, in Plantagenet. Early on, he is portrayed as dull, unaware of the feelings of others and polite, but at the same time a little callous. Yet, Trollope does what he does so well, and Plantagenet is humanized. After being told by his wife that she does not love him, he makes a great sacrifice for her as he gives up his cherished career. He proceeds to behave nobly and without malice towards her. We find that he does love Glencora, though he shows it with difficulty. Yet even at this point of the narrative, Trollope does not gloss over his flaws, they are just shown to coexist with what are significant virtues. In contrast to John and Plantagenet, the personas of George and Burgo can be described as Byronic. They are romantic, attractive and have virtues, yet they have a sense of darkness about them. They are troubled and defiant. Vavasor is vengeful. Both cause understandable worry in the loved ones of the women that they are engaged to. With that, as it seems that in most Victorian novels, the virtues of such characters win out and they establish successful relationships with female protagonists. Something very unusual happens in this book, however. Unlike the fate of most such characters in literature, these two men experience moral collapse that they do not recover from. The last that we see of both men is their downward spirals into degeneracy and failure. The stereotypical Victorian images of the cold, emotionless and privileged man is shown to be superficial in this book. Likewise, Trollope attacks the cliché of the dark Byronic character as being not so bad or as being redeemable. In fact, these troubled men are worse than how they are initially perceived. I think that there are two ways to look at this. In one way, we can say that Trollope is defending the conventional men that society bestows its approval upon. We can also say that the author is reaffirming society’s distrust of the troubled and moody, but charming, outsider. This is a conservative view. Yet, as an author who often rises to defend other, often less empowered, groups, such as women, those who rebel against arranged marriages, etc., in his other books, we can also look at this story as Trollope rebelling against false and clichéd stereotypes of socially acceptable men. Lest I paint too simplistic of a picture here, this is Trollope. He throws much ambiguity into the situation. Plantagenet, and to a lesser degree Grey, are shown in a critical light for being too repressed and, at times, repressive toward those around them. The men with darker personalities, especially Burgo, are portrayed at times, as possessing humanity, charm and other virtues. The world that benefits the privileged men is also seen in a critical light. For instance, there is real pathos shown when Lady Glencora reveals how her initially loveless marriage with Palliser was arraigned. The relatives who scheme to break up and arrange engagements to support their social system are portrayed in a harsh light. There is a lot more to this book than I have touched on above. These themes are just a small part of many that are included within these pages. The role of women and women’s independence is explored. This novel is also an insightful critique of politics that is still relevant today. It is a well-written story that includes a fair amount of Trollope’s witty meta-fiction. The book is full of interesting characters who interact in fascinating ways. I highly recommend this work to anyone who enjoys the literature of this time period. Labels: Anthony Trollope, Can You Forgive Her?